Andrewsarchus mongoliensis, normally known simply as Andrewsarchus, is – at least within the known fossil record – the largest carnivorous mammal ever to live on land. Named after the paleontologist who discovered it, Roy Andrews, Andrewsarchus currently survives only in the form of a massive three-foot-long skull found in Mongolia, and dated to between thirty and fifty million years ago. This fossil is currently held by the American Museum of Natural History. Andrewsarchus was named for Roy Chapman Andrews, but was actually discovered by another member of Andrews’s team in Mongolia, Kan Chuen Pao. Like so many fossils from this region, it was taken from the fossil-rich Gobi Desert, during Andrews’s third mission to the region under the banners of the American Museum of Natural History. Pending the discovery of a complete skeleton, scientists are left to formulate hypotheses by extrapolating solely from the skull – a common problem in paleontology. 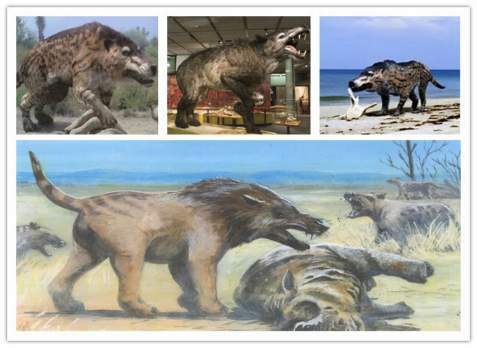 What they have determined is that Andrewsarchus would have resembled a category of early mammalian predators known as the mesonychids, except that it was significantly larger. By way of comparison, its head is about twice the size of today’s brown bears, its body perhaps three times the length of today’s North American wolves, and its weight about twice that of a polar bear. These estimates are necessarily tentative, of course, since no skeleton has actually been found: the skull could have belonged to a heavy, muscular predator, or to a more lithe, sleek one. Moreover, another ever-present danger of extrapolating on the basis of a single specimen is that it is impossible to determine whether Andrewsarchus (as we know it) was an average member of its species, an uncommonly large behemoth – or, for that matter, the runt of the litter, and uncommonly small. If this is an average individual, it is probably the largest known mammalian carnivore to walk the Earth; however, if it is a relatively large individual, than the species as a whole would probably be smaller than other known extinct species, like Sarkastodon and several relatives of the polar bear. Beyond merely estimating physical size, having a single skull to work with introduces other problems as well. For example, it is difficult to ascertain whether Andrewsarchus was a true carnivore or merely an omnivore; and, given this, whether it was a hunter or simply a scavenger. Given its fearsome stature, it probably could have chosen its meals simply by chasing off smaller predators; or, like today’s bears, it might have gained a large portion of its diet from plants and insects. However, the massive size of the skull means it would have had jaws powerful enough to tear through massive bones – either those of large land prey, or perhaps the carcasses of beached whales and other marine life along the Asian coasts it probably frequented. It lacks the teeth most predators have for rapidly tearing through their prey; on the other hand, it may have been large enough simply to have no need of such an adaptation. If it had not already died out (this, too, is uncertain), Andrewsarchus might have gone extinct during the central Asian extinctions caused by the formation of the Himalaya mountains 40 million years ago.